In New Jerusalem we will serve Him (Rev. 22:3) and love Him. New Jerusalem is eternal and all the positive eternal things in the New Testament are related to it. Christ’s eternal redemption cleansed us and His resurrection released the eternal life to us. The eternal redemption is practical into us through the eternal Spirit (Heb. 9:14) and the eternal life is Christ Himself living in us. 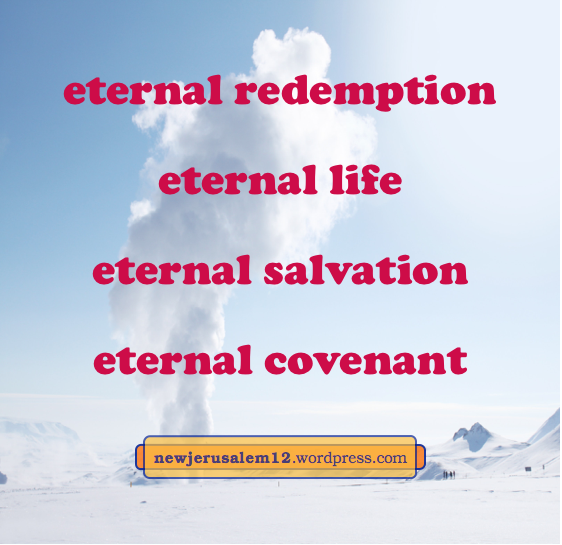 The blood Christ shed for eternal redemption is “the blood of an eternal covenant” (Heb. 13:20). In this covenant all that Christ is and all He has accomplished is guaranteed to us. And He becomes “to all those who obey Him the source of eternal salvation” (Heb. 5:9). Because “Christ, through the eternal Spirit offered Himself without blemish to God,” His blood acts to “purify our conscience from dead works to serve the living God” (Heb. 9:14). We serve God now and will serve Him in New Jerusalem (Rev. 22:3). While we are serving, we have the gift of “eternal comfort and good hope in grace” (2 Thes. 2:17). Outwardly we have trials and sufferings but these do not negate the eternal salvation. Rather, “our momentary lightness of affliction works out for us, more and more surpassingly, an eternal weight of glory” (2 Cor. 4:17). Based on this vision, Paul said, “I endure all things for the sake of the chosen ones, that they themselves also may obtain the salvation which is in Christ Jesus with eternal glory” (2 Tim. 2:10). Salvation with eternal glory brings glory into us and brings us to New Jerusalem, the city of glory. Photo by S.L. Wong via pexels.com. How do we get into this eternal priestly service? The praise in Revelation 1:5b-6 says, “To Him who loves us and has released us from our sins by His blood and made us a kingdom, priests to His God and Father, to Him be the glory and the might forever and ever. Amen.” The death and resurrection of Jesus Christ released us from sins and made us a kingdom of priests! Becoming priests is not by our choice nor by our effort. And we should not question or doubt our qualification for this service. It does not depend on us—He “made us a kingdom, priests to His God and Father.” This declaration in 1:5-6 is confirmed by the same word in Revelation 5:9-10. 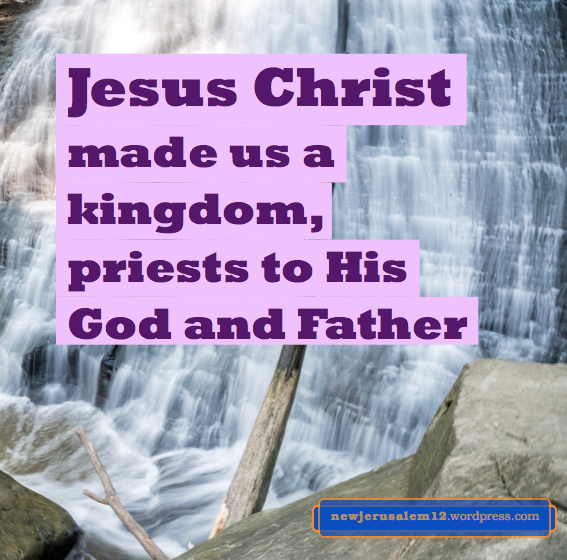 He made us priests and He is our High Priest. As such He is “merciful and faithful” (Heb. 2:17), “great” (4:14), “holy, guileless, undefiled, higher than the heavens” (7:26), and perfected forever” (7:28). Jesus Christ is so much, and we, always coming to Him (1 Peter 2:4), “are being built up as a spiritual house into a holy priesthood to offer up spiritual sacrifices acceptable to God through Jesus Christ” (2:5). We are not merely individual priests, but are being built together as a priesthood. As such we are “priests of God and of Christ” now, in the coming age (Rev. 20:6), and in New Jerusalem eternally. * Some other verses with this word for serve are Matt. 4:10, Luke 2:37, Rom. 1:9, 2 Tim. 1:3. God and the Lord Jesus Christ are our Master and we are His slaves. Revelation 22:3 says “the throne of God and of the Lamb will be in it [New Jerusalem], and His slaves will serve Him.” In this age we should be faithful in serving as slaves. If so, in the coming age our Master will reward us, and this reward will be a foretaste of blessings in New Jerusalem. 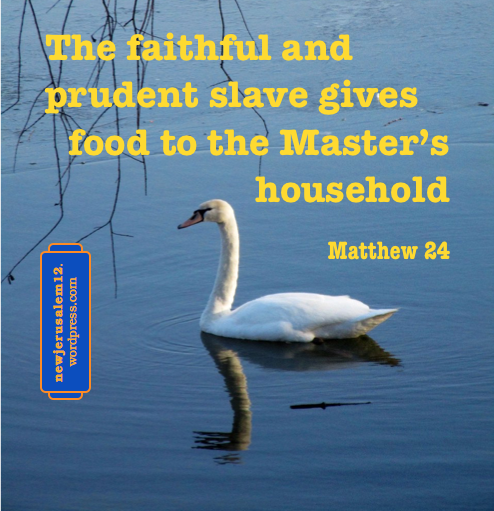 In Matthew 24 is a slave assigned to give food to members of the Master’s household. “Blessed is that slave whom his master, when he comes, will find so doing. Truly I say to you that he will set him over all his possessions” (v. 46-47). In Matthew 25 is another slave who invested the gift His Master gave him. The master went away and returned after a long time, a picture of the Lord’s second coming. 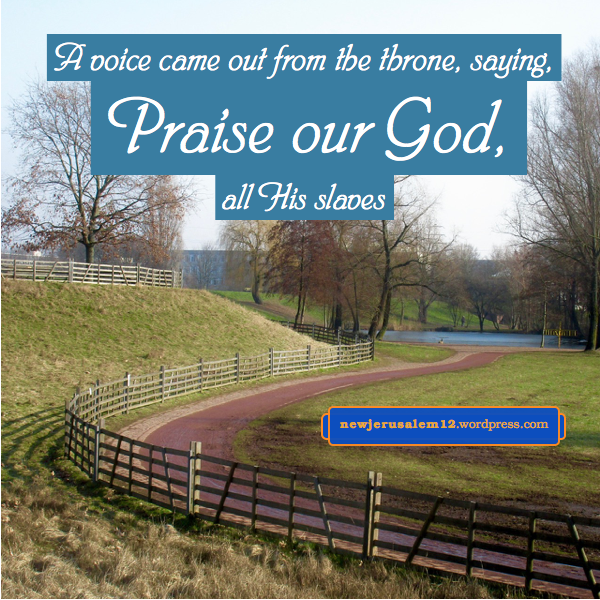 “His master said to him, Well done, good and faithful slave. You were faithful over a few things; I will set you over many things. Enter into the joy of your master.” Our Lord’s, our Master’s, great joy will be in the kingdom age and His fullest joy in New Jerusalem. In both parables the reward includes being set over many things. This corresponds with the reward of the kingdom age in Revelation 20:6 and the eternal reward in New Jerusalem in 22:5. In New Jerusalem the Lord God shining upon us is also part of our reward. Revelation 22:3 tells us that as slaves we will serve God in New Jerusalem. Many verses present God and the Lord Jesus as our Master, who acquired us as slaves by buying us. Second Peter 2:1 says that our Master bought us. This is His redemption. A definition of redemption in the Oxford Living Dictionary is, The action of regaining or gaining possession of something in exchange for payment. God created us for Himself but we were taken away by Satan. Through the death of Christ we were redeemed, regained by God in exchange for payment. We are told “You have been bought with a price.” (1 Cor 6:20). This price, God’s payment for us, is not corruptible things like silver and gold, “But with precious blood, as of a Lamb without blemish and without spot, the blood of Christ” (1 Peter 1:18-19). In Revelation 5:9 a heavenly song praises the worthy Lamb, “You were slain and have purchased for God by Your blood men out of every tribe and tongue and people and nation.” The next verse praises the Lamb for the outcome of redemption, He made us “a kingdom and priests to our God.” This ultimately indicates New Jerusalem, God’s eternal kingdom with us in His eternal priesthood. Acts 20:28 also shows us God’s purchase and His goal. 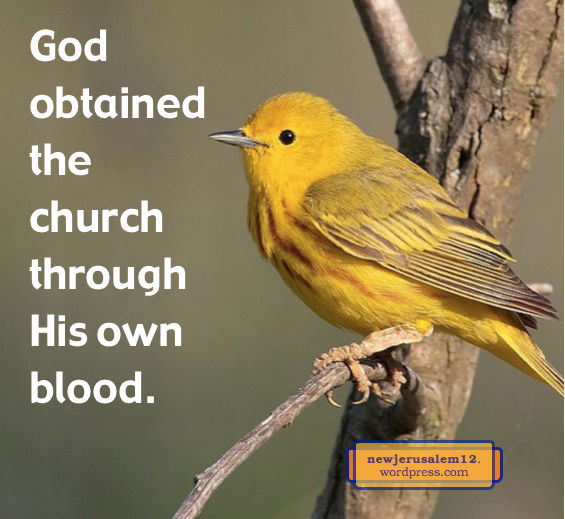 “The church of God, which He obtained through His own blood.” God, through the blood shed by His Son, purchased us out of every tribe and tongue and people and nation. Based upon this redemption we received eternal life which constitutes us the church of the living God, the house of God (1 Tim. 3:15). This church grows into God’s ultimate dwelling, New Jerusalem. Revelation 22:3 says “the throne of God and of the Lamb will be in it [New Jerusalem], and His slaves will serve Him.” Three posts have looked at all of us as slaves of God. 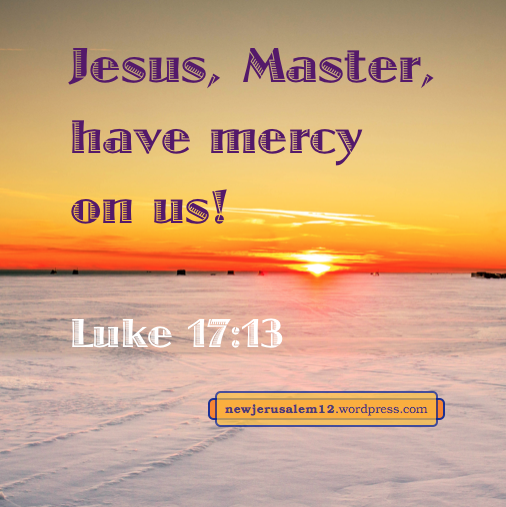 Now consider a few verses showing the Lord Jesus as our Master, the One whom we serve. “No one can serve two masters….You cannot serve God and mammon” (Matt. 6:24). We serve our Master, God, now and in New Jerusalem. Then, the parable in Matthew 13:24-30 portrays the Lord as the Master, who sowed good seed in his field to bring forth sons of the kingdom of God. What He sows is always good. In a parable in Matthew 18, the Lord as the Master was moved with compassion and forgave His slave’s debt. This is a picture of the forgiveness of sins that we received. However, later the Master disciplined the slave because he did not forgive his fellow slave. Full forgiveness, from the Lord to us, and from us to one another, is necessary on the path to New Jerusalem. Finally, Colossians 4:1 instructs human masters “grant to your slaves that which is just and equal, knowing that you also have a Master in heaven.” Our heavenly Master is just and equal, having no respect of persons. This righteousness, equal treatment, forgiveness, mercy, cleansing, and more characterize the One we will serve as slaves in New Jerusalem. The New Testament has a living temple— God Himself and all His people. Eventually this temple will be New Jerusalem. In the Old Testament times, before our redemption and regeneration, this living temple was portrayed by a physical temple. We who will serve in the temple will serve in God, the living temple. And we will dwell in Him. And be “before the throne” in New Jerusalem (Rev. 22:3), supplied to serve by the flow from this throne (22:1-2). This is New Jerusalem: we dwell in God, God dwells in us, God supplies us, and we serve God in God! Very much like the Lord’s word in John 14:20-23—we are in Him, He is in us, we love Him, the Father loves us, and He and the Father make a dwelling with us. When we love Him we are surely willing to serve, and we serve Him while dwelling in Him, in the living temple. New Testament worship is in spirit (John 4:24). It is not dependent on a physical location nor a material building. The New Testament temple is a living temple, from the Lord’s incarnation onward to New Jerusalem. In John 2, Jesus is the temple, in 1 and 2 Corinthians and Ephesians we are the temple, and in Revelation 21 the Lord God and the Lamb are the temple. Is this living temple the Triune God or His people? Both! This corresponds with the Lord’s word in John 14:20. We are in the Triune God and the Triune God is in us. Thus the Triune God is the temple and we also are the temple. This also corresponds with the epistles: we are in Christ Jesus (Rom. 8:1, 1 Cor. 1:30) and He is in us (Rom. 8:10, Col. 1:27). We are one with Him in life, so we are one with Him to be the living temple and to be New Jerusalem. In New Testament Greek two words are translated “temple.” In the verses in these “living temple” posts, the Greek word means the inner temple, the holy place and holy of holies, not including the surrounding structures and courtyards. This inner area is only for the priests, and today we are priests. “Jesus Christ…loves us and has released us from our sins by His blood and made us a kingdom, priests to His God and Father” (Rev. 1:5-6). We are priests serving in spirit, in the living temple, fulfilling the Lord’s word in John 4:24. We will be the same in New Jerusalem. Revelation 22:3 says, “His slaves will serve Him.” The word “serve” means to serve as priests. 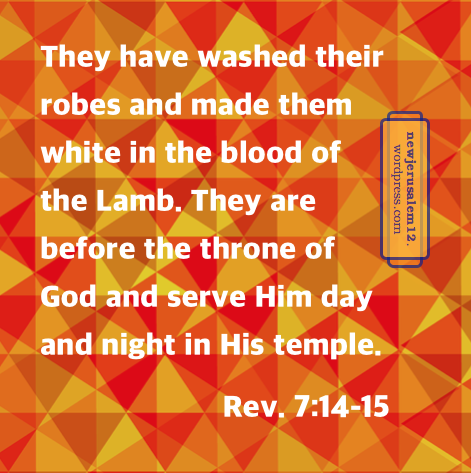 In New Jerusalem God and the Lamb are the living temple and we are the priests serving God and the Lamb.